"Imagination is more important than knowledge"- Albert Einstein. Unless you are in Clark County Schools. I believe very strongly in a public education for all children. I am married to a teacher. As an employer, albeit a small one, I think a strong education system is vital to attracting and keeping businesses in the area. I don't want to live in a city of morons. Las Vegas was most recently named the Dumbest City in America for the lack of our academic prowess. It's an embarrassment and a shame. Our school district frequently ranks near the bottom of all national rankings. I usually blame the parents, but this time, this time, my friends I am blaming the system. We have a principal at our school that I was warned about from nearly everyone in our neighborhood prior to starting school. I would like to add that towards me directly, she has always been professional. I personally have had no bad interactions with her. I, at first, thought people must surely be exaggerating. I do not doubt the stories any longer. I will get to that in a minute. I don't want to get involved in employer/employee issues. It's not my role as a parent. It is not my issue. My issue is they took the crayons out of the first grade classrooms. There is, apparently, no need for crayons any longer at the first grade level. Sorry kids. You're 7. Time to grow up, Buttercup. When my daughter told me this, I thought I misunderstood. It was towards the end of the year. I thought maybe the crayons were looking nasty and they were cleaning up. Or that kids had been eating them. That was popular with a few kids when I was in 1st grade (and glue...although for some, that seemed to continue into adulthood...). Nope. The principal told the 1st grade teachers to get rid of the crayons. They are not part of the core curriculum and therefore, since they are not tested on coloring, there is no need for it. Coloring is creativity. Creativity is absolutely, positively what makes our country stand out. New ideas. Ingenuity. The Mother's Day gifts this year had to utilize the core curriculum. No pencil holders or vases. Or the politically incorrect ashtrays that we made when I was in school. My daughter's teacher whom I love had them do these cute little construction paper purses and they wrote facts about their moms, like they were books. It was great. Honestly, I preferred it over another vase. But the teacher had to fight to show that it was part of the blessed curriculum. Astrocamp- a weekend spent in the mountains with scientists studying astronomy, geology, physics while ziplining and rock climbing that I was privileged to chaperone for my son's 4th grade class-- was cancelled. It interfered with the testing dates. Seriously people- what do you think my son benefited from more-- a standardized test or Astrocamp? Sea Camp-- something my son has been looking forward to for the past 5 years-- was intentionally moved to a date that will be impossible for the teacher to get enough kids to sign up for-- because it's expensive. Oh- and we can't do fundraisers for it. All fundraisers go into the school general fund. You guessed it- tutoring. Which is a fancy way to say "test prep." The criteria for qualifying for this tutoring is your test scores. And the Rubik's Cube club that I wanted to start-- nope. It would interfere with the tutoring. When I pointed out that the kids who were in tutoring probably wouldn't do the Rubik's Cube club, I was told that if not every kid could participate, then we (the school) couldn't do it. It almost sounds logical. We hold the national championship for Rubik's Cube in Las Vegas, by the way. Which is what inspired my son to want to start it. Other elementary schools have teams and compete. Or what about the other 550 kids who don't go to tutoring? Do they have to suffer? My son, who does robotics, was set to share his knowledge with the upper grades last year. The principal found out about it and he wasn't allowed. He was very upset. It wasn't part of the core curriculum. Now, I will say, some of these activities cost money, so that was also an issue. But again, when kids can't raise funds for their specific activities, what are their options? Sorry kid-- you are poor. You can't do anything fun. Now back to filling in bubbles. Our school is representative of everything that is wrong in education today. My friend's daughter was recently flagged as needing special education. They suddenly started to get robo calls from the school telling them about open enrollment options at other schools. Her other daughter, was welcome to stay. No robo calls for her or my children about open enrollment and transfer options. They were basically trying to pawn off her daughter to another school. To keep their test scores up. And the WORST part- after having 30% of the staff leave on a regular basis- is the district has known there were issues for the past 7 years and has chosen to do nothing about it. That made me flip my lid. Seven years they've been looking into the high staff turnover and high request for zone variances out of the school. Seven years. They have reports tracking the departure of teachers and students. Because the test scores are great. And again, I don't know that I necessarily fault the principal-- she is doing exactly what she is being told to do. To a point that it's ridiculous, yes, but still - nearly half of her evaluation is based on test scores. Test scores that should be used to evaluate where children stand. To decide who needs more help and give them the additional assistance needed. To identify gifted children and make sure they are given extra resources to thrive and meet their potential. They are not, nor should they EVER be used to determine compensation or teacher and administrator competency. Because, I'm sorry, my child's education should be incentive enough. There shouldn't be a bonus or a promotion if they learn. And the children that need help shouldn't be shoved aside or forced to stay after school so they can take a standardized test so people get paid or rated well. These aren't widgets. They are children. They are unique individuals. Of course there are bad teachers-- that is why they have evaluations. That is why when the parents kick and scream the district should listen. And clearly they don't. They should not use standardized test scores as a defense to prove that someone is a good teacher. And crayons, my friends, they are not the weapons of anarchy. When creative and original thought becomes a negative within a system- for students and teachers-- we have taken 10 steps backwards. I don't want to live in the world where people can't think or see the forest for the trees. I don't want to be in a district where SEVEN years of complaining is overridden by test scores. Test scores that are "earned" because of behavior that is harming my children's education. When you take crayons away from children you are essentially duct taping their minds. They are taking away the crayons. We must act before we live in a world without color. A particular school immediately came to mind when I read this blog and unfortunately it's probably not the school you're talking about. Far too many schools in our district place a need for the social/emotional/creative growth of our children below test scores in importance. As a teacher, I'm more concerned about the people my students become --the kind of citizens/parents/lawmakers/wage earners they will be -- than with how they perform on standardized tests. Title 1 Kinder and 1st grade students are tested via computer using multiple choice tests (with little exposure to/experience with computers) and those tests are used to show their progress, rank them and rate teachers. Kindergarteners aren't allowed 10 minutes a day for social play and unscripted peer interaction, but we can spend 30 minutes of precious "educational" time each morning feeding breakfast to the masses (instead of having them arrive early and eat before the school day begins). Like many CCSD schools, ours suffered the loss of a large percentage of our teachers each year since we opened in 2008. This year, there was a mass exodus. How can we educate the neediest of our students without a stable, experienced staff? It's time for parents to stand up and demand better for their children. 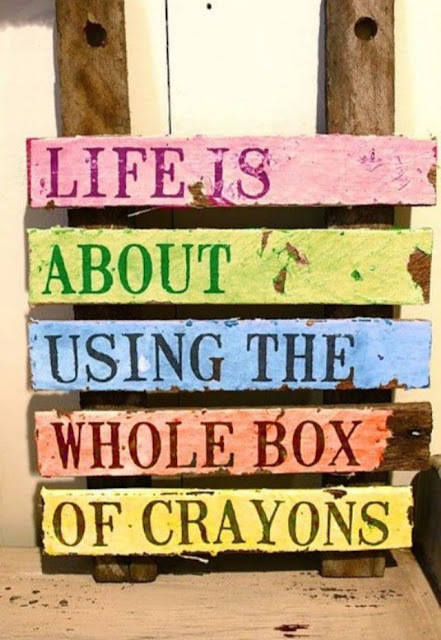 The thing about crayons is, it's actually not even the attack on creativity that is the issue. Using crayons, and particularly, using coloring books and the like that encourage you to "stay inside the lines", help kids with small hand/eye coordination and concentration. Things that are really really beneficial later in your academic career (as well as the rest of your life). If you can master crayon work, you will probably do better at the core curriculum later on. That small hand/eye coordination is a building block. I totally agree with you. But, I too, sadly had a poor public education. My potential was there until it was squished into a neat box that said, "No you can't to that". Now i fight with my children nearly everyday to give them a better education than I know is available here in LasVegas. As of today I have been homeschooling for nearly 5 years and I do not want to stop. Not only do my children understand research they also understand independence. If they do not meet expectation they don't get to run and hide and blame the teacher for being too hard. I am the teacher and I am firm about what I want out of them. Without pushing they understand concepts foreign to children their age. They know what a dictionary is and have had their little hands flip through the pages trying to dissect the information to find it for themselves. Once in awhile I check the CCSD website to see what standards are expected and then I think about the standards of my own education. Today it is lower and highly ridiculous. Core Curriculum has disabled teachers and parents from bringing about a well informed and educated youth. The district leaders are just concerned about their own salaries. Even a run in with CPS has shown me that they will go to any length to take your educational freedom away. They tried to quote their opinion as law that I am not allowed to homeschool and children are required to be in a CCSD program. How foolish of them. How illegal of them. Brainwashing our children into believing the minimum is just fine does nothing for this country. So sad that crayons are on the watch list. But yet another reason I will not give in, even when it becomes illegal, to homeschool my children with reason, logic, books, and Crayons!! So true! You can ask for a zone variance and a grade advancement and send her to my classroom. We have crayons, markers, colored pencils, highlighters, iPods, and macbooks, all used so that students can have the opportunity to show what they know in alternative ways. Yes we take the STUPID CRTs, Discovery Tests, and AIMS Web tests - all ridiculous, but the Common Core Standards DO NOT state that children should not use crayons. That is ONE of the problems with CCSD - Administrators who have no clue how to apply the CCS in the classroom. They sat in on a couple of meetings about it and were told by some A## H### that coloring is not in the curriculum. It's not about the coloring, it's about students proving what they know. Hell, if some of my students would color their responses I would be thrilled. Keep fighting the fight Lori. You ARE the sanity amongst the crazies. As you know from listening to Shane's frustration, the school board will listen to you long before they will listen to those of us who are in the classroom daily doing EVERYTHING WE CAN to help students succeed. Amen! I would love for you to send this to the newspaper. Yes, This definitely needs to be read by many people. It should be in the papers! You have my permission to forward this. The saddest part of all is that this is nationwide. Those of us who teach have been sounding the alarm for years now. However, the politicians and policy makers ridiculed us as not wanting to be evaluated. The old "bait and switch" was used to direct parents attention away from what was happening to their children to "bad" teachers who didn't want to be accountable. All I can say is parents have the power and need to stop this insanity! My classroom is made up of a very diverse group of English Language Learners. Our state requires them to take the grade level tests if they've been in our country 12 months. Explain to me how a student who knew no English 12 months ago is supposed to take and pass an 8th grade standardized reading test. It's absurd! My ELL's took 14 tests between January and May, some of which took two days to finish. I'm sorry, but that's abusive at any level. They aren't allowed to have electives because we have to "remediate" them to learn faster. Then, the admins and school board wonder why we have a high drop out rate with these students; we've made it clear to them from the beginning.... they can't pass the tests, so they must be stupid. Why should they continue to try? Please, please, please parents in every state MUST start advocating for not only their own children, but for the children whose parents don't understand what's happening to their students. So are we ready to take the gloves off and not play nice anymore? I have been screaming about this since 1998 in Florida where Jeb Bush and his merry band of public school destroyers started all the crap you are living now and no one, my colleagues included, were willing to fight back when it was winable. Now we are being deluged with idiocy and we are expected to take it both as teachers and parents, while THEIR kids are protected in tony private schools who would NEVER subject their kids to this draconian crap. Get angry and start protesting. I am. Treating crayons as contraband somehow crossed a line with me. THis infuriates me! We have changed to a charter school and it is better, but apparently this kind of crap is going to start happening more often. I have always been against home schooling for my children (my own personal choice, not saying anything against anyone else's choice), but I can see that I could get to a point where I would seriously consider it so they can still be CHILDREN! I would love to write a petition or do something about it! When we got married in Vegas we had to use a Clark county issued black crayon to fill out the marriage license..
Andmighty helpful filling in bubble sheets. I just wanted to let you know that I updated the blog a bit- added some links, etc. When I realized it was going viral and not just staying local, I thought people might want links and more clarity. I also spell checked-- my blogs are usually first draft, "mind farts" as I call them-- I know, classy term. I'm not a professional writer and I treat this blog fairly casually-- it is not, by any means a negative reflection on my excellent high school English teachers!! I'm just a sloppy typist and a bad proofreader. Thank you so much for sharing this blog. It truly means a lot to me to see all the support and that I'm not crazy. Maybe together we can all get common sense back into schools. No Child Left Behind did a lot of damage to schools that were already suffering. Public schools are not perfect by any means, but if the same criteria was used to judge my parenting, well.... I would not be 4 star either. I would simply be "Approaching Standards" in many areas of my life. Testing is not a bad thing. It's simply an assessment of a student at the moment in time. Not the teacher. Not the school. The student. At that moment. Somewhere we lost sight of that. Education is multi-faceted. Teaching young children to be responsible, young adults is just as important as academic skills. We need more thoughtful, kind people who can think for themselves. Please, fight the fight. Get involved. Ask questions. Ask your teachers what you can do to stop this nonsense. It's expensive, it's useless and it's taking time away from the very things that make school a fun community. I love that Ken Robinson TED Talk. This is precisely a reason my husband and I have decided to unschool our children. Testing teaches nothing. Experience teaches everything. I was born and raised in Las Vegas and even became a teacher and taught in the CCSD. I actually QUIT teaching after my 5th year because it was soooo bad. Not just for the students, but for the lack of administrative support for the teachers. I decided when my kids became school age we would move for their education. I currently live in Colorado and am so grateful we did! Ditto to everything you said! I am so impressed with your blog. It is well written, factual, sassy, and funny. I have so enjoyed reading your perspectives on education, being a mother, and being gay. I can't wait to read more. wow that is unbelievable. How sad it is that kids can't use their creativity and imagination in any grade. I would never work in a school that allowed that! or send my child there. If you stay there, you need to rally for the kids and get others to join you to fight for the kids at the board meetings and other public forums. Good luck to you and your family! This is what is happening in our schools in AZ too. Thank you for giving so many of us a voice. Anonymous I agree with everything in your blog. I no longer teach in public schools in Arizona. This is due largely to the fact that all the rules and regulations imposed on students are created by legislators who have no idea what children need academically much less have the ability themselves to recognize a crayon. I definitely think your blog should be forwarded to newspapers all over the country. It's time for everyone to stand up for what is right for children.